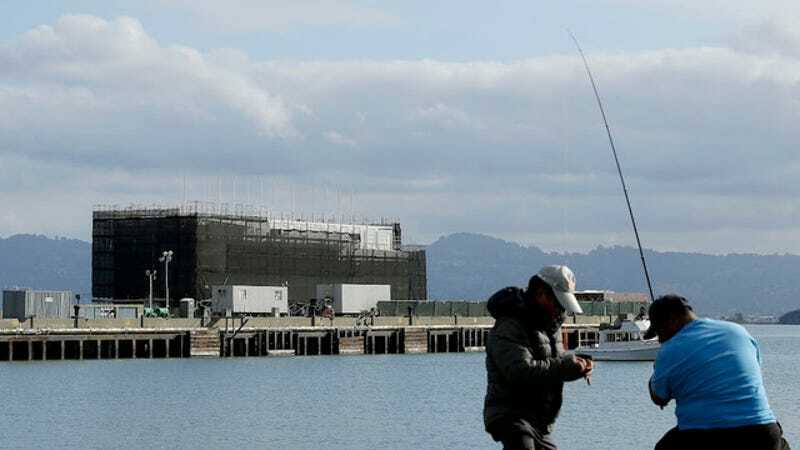 Following scrutiny from the Coast Guard and an investigation by the San Francisco Bay Conservation and Development Commission, work on Google's mysterious docked barge has stopped. CNET reports that the barge has been covered in scaffolding and black netting ever since the Coast Guard stopped by for an inspection on October 23. Since then, nobody has been working at the site except for a lone security guard, giving enough reason to believe that the barge won't be up and running until at least spring 2014, when it's supposed to become some sort of traveling showroom for Google products. (It was supposed to be unveiled in November.) There's no word on what's happening with the East Coast barge being built in Portland, Maine.